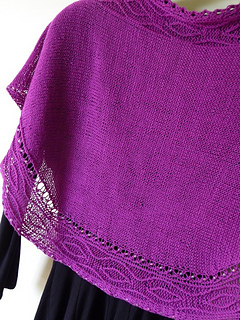 Banbha is the first shawl in The Éire Collection. This collection of shawls celebrates the three sister Queens of Ireland. Banbha is the calm, serene and gentle sister. While showing off her regal side she whispers “Ireland” to you in her poetic voice. Banbha is a vision of small, delicate cables that gently rise, crest and fall back down again into smooth, silky stockinette. The curved length of Banbhas border is enhanced by not only elongated cabled ovals, but also beads which sparkle, shimmer and catch the light when worn. Banbha is worked from side to side and the placement of increases and decreases are what give Banbha her trapezium shape. Banbha is easily adaptable and this is explained in the pattern notes.